Cape Cod Bay is that magical disk of sea framed by the terrain of Cape Cod, that flexed arm shaking its fist at the Atlantic. Over the past few years, it has emerged as one of the greatest oyster terroirs in the world. We always knew about Wellfleets, the quintessential New England oyster, nurtured in that wonderfully protected harbor in Cape Cod’s forearm, and known for their ultraclean Atlantic brine. But draw a line west from the curled fist of Provincetown to the Massachusetts mainland and you’ll see an even better harbor, Duxbury Bay. This, of course, was where the Pilgrims ended up, but it’s better known to ostreaphiles as the home of Island Creek Oysters, the new standard bearer among New England bivalves–again, so clean, so salty, so SEA. None of those metallic flavors you get as soon as you cross the Cape and hop into Long Island Sound. 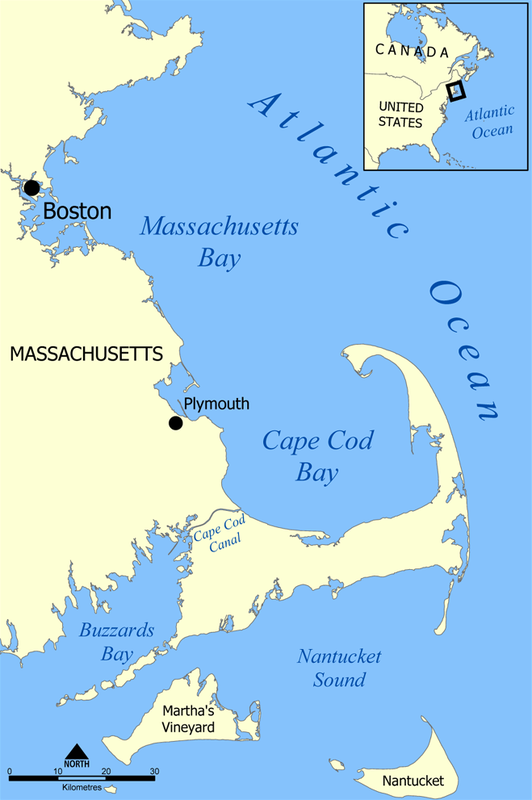 Now, cast your eye over the map of Cape Cod Bay. What do you see? Yes, one more world-class harbor, right down at 6 o’clock. (Harbors are important for oysters–and oyster farmers–because they protect them from getting slammed by the open sea.) This one has been overlooked by the oyster world, but no longer. Put Barnstable Harbor on your bivalve map. Back in 2008 I tasted Scorton Creek Oysters from Barnstable Harbor and gave them two thumbs up. Today there are two other Barnstable Harbor oysters in general circulation, and they are two of the best I’ve sampled in years. They are right up there with Colville Bays from Prince Edward Island, and that’s high praise indeed. You’ll immediately notice that these two sister oysters share a lovely, opaque, creamy color–always a sign of sweetness in an oyster. Likewise, both have a sweet cream flavor–the Beach Points rich like a bechamel sauce, the Moon Shoals closer to a bearnaise, with a whisper of herbal, mineral flavors, like a clam. The primary differences in these oysters come from their growout methods. Moon Shoals actually spend their infancy as Island Creeks, at IC’s upweller under the docks at Duxbury Harbor. Moon Shoal grower (and full-time fireman!) Jonathan Martin purchases the seed from Island Creek and transfers it to his own suspended trays in Barnstable. When they are about a year old, Jonathan plants them on the sandy bay bottom to finish, strengthening the shells and the flavor. Beach Points, by contrast, stay in suspended trays. Their farmer, Mark Begley, tumbles the oysters to strengthen the shells. That’s also what gives them their distinctiveness steamshovel-scoop shape. West Coast oyster eaters are familiar with tumbled oysters, such as Kusshis and Blue Pools, but it’s something we haven’t seen much of on the East Coast. Hopefully that is changing, because tumbling does wonderful things to oysters. Not only does it give them deep cups, it also seems to give a brighter, cleaner, sweeter flavor. Both Moon Shoals and Beach Points are true boutique oysters. Jonathan Martin grows 50-70,000 Moon Shoals per year, while Mark Begley raises a mere 30,000 Beach Points. That means each oyster gets the attention it needs to develop full deliciousness. (Perhaps more to the point, it means oysters that don’t quite make the cut are seen and culled long before they get to your plate.) It also means they can be hard to find. Your best bet is Island Creek Oyster Bar, where they are as regular as Norm and Cliff on Cheers. I’ve also seen them at Neptune Oyster and Russell House Tavern. (Yes, the city of Boston seems to swallow most of the supply, which is only fitting. Let the Yorkers have their Naked Cowboys.) If you’ve seen them elsewhere–better yet, if you’ve tasted them–please weigh in. We’ve had both at Waterbar in San Francisco, and on par with Colville Bays is the appropriate praise. Beach Points, especially, have that amazingly rich lobster stock or shellfish stock finish that IC oysters and Rocky Nooks have. With so many amazing oysters coming out of Cape Cod, it’s hard to choose a favorite. These are certainly up there, close to the amazing Sunken Meadow Gems. Thanks for the nice read, Rowan.